Miller Balsamo, a historic Italian motorcycle brand, was founded in 1921 by Ernesto Balsamo and Edgardo Mario Balsamo, based in Milano. They were initially importers of the U.S. brand Excelsior and the British Ariel. In 1921 they produced their own motorcycles with a 123 cc two-stroke and 173 cc models with a Moser or Python kopklepmotor. In 1924 they launched the Excelsiorette cycle with an auxiliary engine to the market, which was not a success. Later, there was a 248 -, 348 - and 498-cc model with four-valve kopklepmotoren by Python and from 1934 a 98 cc Sachs-block, and an addition of an own 246 cc kopklepper engine. 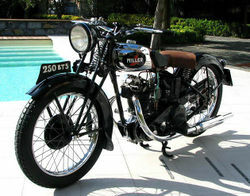 During the Second World War, Miller-Balsamo apparently produced in those years a 98 cc and 200 cc model. After the war, they added more models, 123 cc to 246 cc and a 249 cc kopklepper. After 1950, no more new models were added, except a moped that appeared in 1957. The factory ended up closing in 1959.